Felt is one of the most common materials used for covering flat roofs. 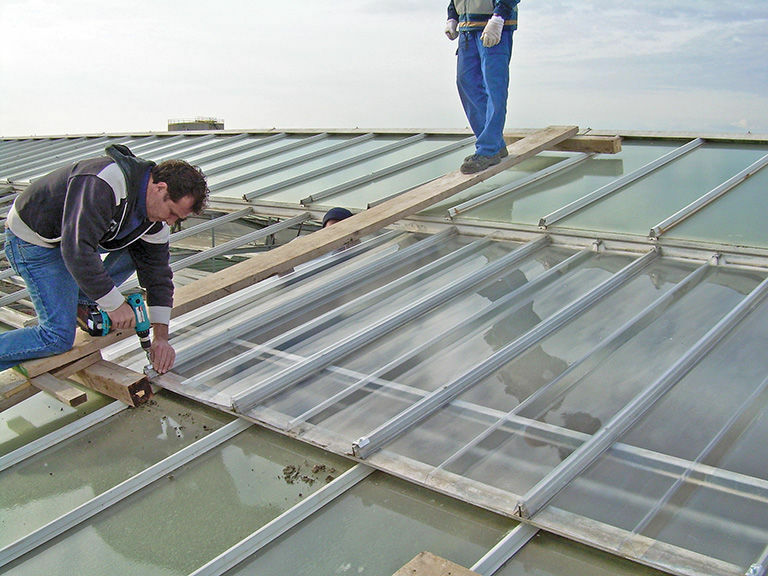 Out of the three flat roof materials we use, it is the most cost effective solution. If installed properly, it can prove to be a safe and reliable roofing material for a residential or a commercial property. It can be made to prevent the ingress of moisture by coating a layer of tar that acts as a water resistant. Felt roofing is also durable therefore it can cope with harsh water and wind conditions easily. Not only that, whether the surface is flat, pitched or curved, regardless of the size felt roofing can be applied. 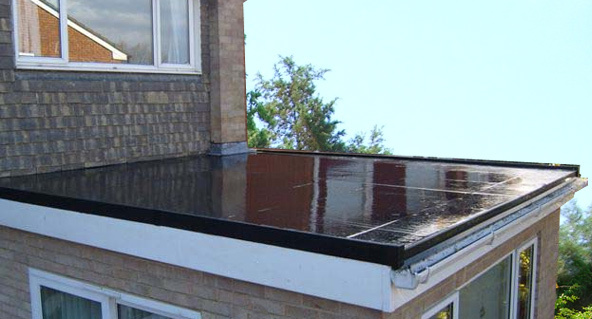 Fibreglass is in our opinion the best type of flat roofing material. It is extremely light weight, non-absorbent and fire resistant. 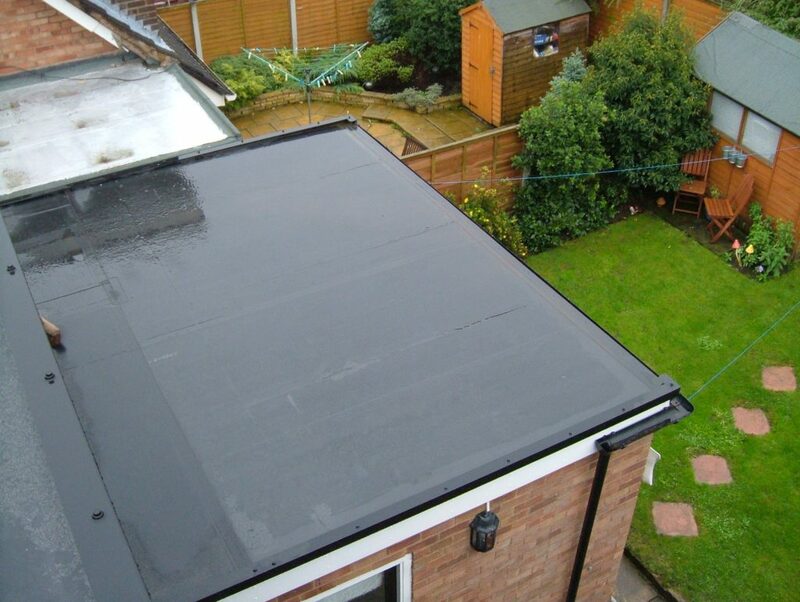 Fibreglass flat roofs are highly durable, weather resistant & aesthetically pleasing. Their tough durability provides full reliability throughout extreme weather conditions, which as we know in the UK is far too common an occurrence. In order to complement the exterior of the house, fibreglass comes in a wide range of colors and creative designs and patters. So with all these benefits Fibreglass offers rest assured that whether it is a heavy downpour, water won’t remain stagnant out there and won’t leak into your walls damaging your home. If your house has a low-slope or flat roof, then you should consider rubber (also known as EPDM) roofing. This roofing material brings down the labor costs to minimum as compared to other roofing options and also exhibits an extraordinary durability that provides magnificent resistance to tears and abrasion. EPDM rubber roofing enables easy repair options and low annual maintenance costs, and it comes packed with superior flexibility and immense strength. Also, the rubber membrane can easily contour to fit the varying roof shapes as it is applied without heat. This type of roofing has increased longevity, safer installation and improved weather resistance as compared to other flat roofing materials. Rubber EPDM roofing can last up to 10 years with environment friendly characteristics and tendency to withstand extremes of temperatures. As with any improvement to your property, ensure your hire a reputable contractor to carry out the work. There is plethora of styles that are available under the broad category of flat roofing. Take for an instance- the single-ply roofing. Regardless of whether you have chosen EPDM or TPO (Thermoplastic Olefin) as roofing material, single-ply membrane can be installed anytime. Similarly, paint-on style is gaining traction as of late. Here, you have to use, either foam insulation or roof coating, for building the top. Build-up roof style is quite another old type for flat roofing. Fully adhered method is one of the most significant ones in the market. This requires the casing to be attached with the insulation in a straightforward manner. Mechanically attached method is another well-known procedure. This one incorporates securing of membrane rows with rivets. Among all the methods of flat roofing, EPDM is the least hazardous during the time of installation. The trend of flat roofing is still on the rise. It means it has not become wide-spread yet. This is the right time to stand apart with your flat roofed, smart looking home amidst the cookie-cutter buildings. This kind of roofing is praised for insulation. Make the roof-foundation strong during installation and you can grow your own rooftop garden later. Besides, an extended flat roof can be converted into a spacious decking area. You can enjoy your afternoon tea-party here every day. Learning few DIY tricks to mend small leakages or any other itsy-bitsy repair job on your flat roof would prove helpful in the long-run. In case of EPDM roofing, the membrane sometimes may off. Buy black rubber glue from the market; apply it to the casing where it’s corroded. For any minor damage, the easiest way out would be covering the roof with a plastic sheet first, to save it from harsh water or other weather condition. After that, find out the solution. On a regular basis, trim down the tree leaves that are suspended over your roof. This will slow down the accumulation of debris on the roof. Look for sudden growth of moss, as it indicates internal water seepage. What happens when your flat roof begins to leak? You might discover a stain on ceiling one fine morning. This will surely prompt you to make a hurried call to repairing service. Refurbishing involves multiple steps- first, patching up and then, fixing up the water soaked insulation, rafters and roof deck. Lastly, the stain on the ceiling must receive fresh coat of painting. If you calculate the estimated cost each step incurs, it might exceed your budget. So forget repairing and go for replacing the roof. This will be a much easier and inexpensive alternative.